white aluminium system complete with all fittings except fabric and thread. 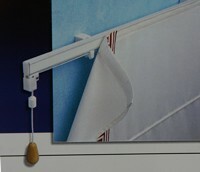 header rail comes complete with self-adhesive hook tape – blind is fixed to it with sew-in loop tape. 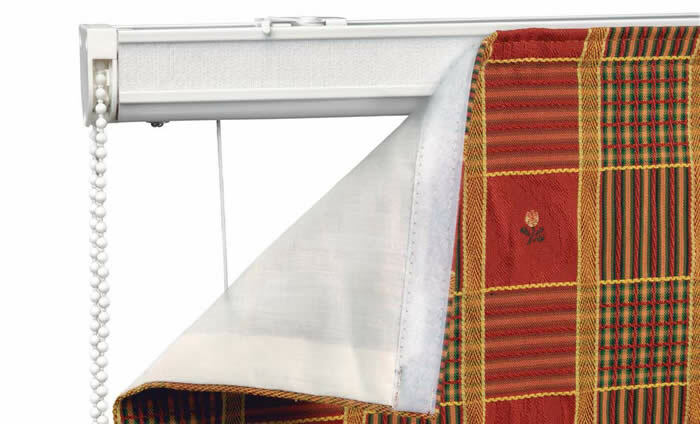 A sturdy aluminium header rail with hook tape, brackets and cord guides allows the blind-maker to use the familiar corded system with a modern twist. The cord lock on the end of the rail locks the cord in place when pulled to the side, so no cleat is needed. The cord lock can be fitted to pull sideways or to the front. Of particular use when heavier blinds are being made. Roller cord guides take the place of simpler cord guides to ensure super-efficient operation.